Now you can file your income tax return from desktop. You need not to visit e-Filing site to upload your XML return file. Income Tax Department has released Java based utility by which allows you to file tax return by single mouse click. Visit to tax site is not required but Internet connectivity is mandatory for this utility. 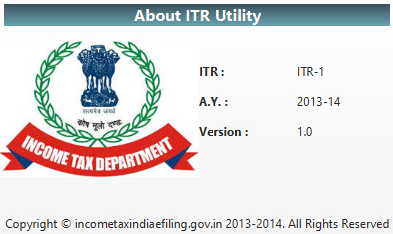 This utility is available for ITR1, ITR4S & ITR7. These utilities are developed using the latest in JAVA technology and effort has been made to make it user friendly, simpler and faster for preparation & submission of tax returns. Please make sure you’re connected to the internet to get seamless experience while using this utility. This utility can run on operating systems like Windows 7, Windows 8 or above and latest Linux, where Java Runtime Environment Version 7 Update 6 (jre 1.7 is also known as jre version 7) or above is installed. You will be prompted to provide your User ID, Password and DOB/DOI to fetch the data from e-Filing site. 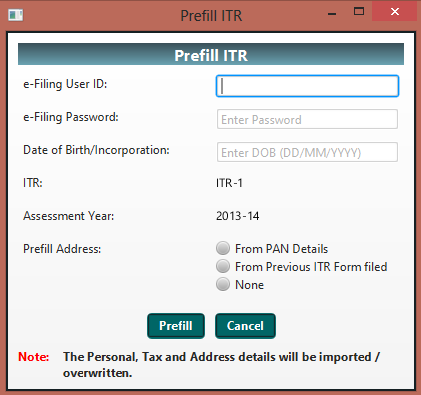 You have option to get address detail from PAN details or from Previous ITR form filled. This option is for importing the XML (successfully generated earlier) of a particular A.Y. Select the path and import the XML. You should check/validate the contents before finalizing upload/submission. Save Draft -The unfinished work can be saved as XML in the path you have selected. Please note that you cannot submit this XML without filling complete details. Click this button to upload the XML in e-Filing portal. You’ll be prompted to provide your e-Filing credentials, User ID, Password and DOB/DOI. Post submission, the success message and the acknowledgment number will be displayed. You will be able to download ITR-V. Please make sure you’re connected to the internet to avail this feature. (if the return is submitted without a DSC). This option will let you know the shortkeys, instructions, settings and how to use this Utility. Please read them carefully to understand and complete the activity with ease.